Brown Stem Rot is one of the lesser abundant diseases in my area, and is often easily confused with soybean Sudden Death Syndrome (SDS). 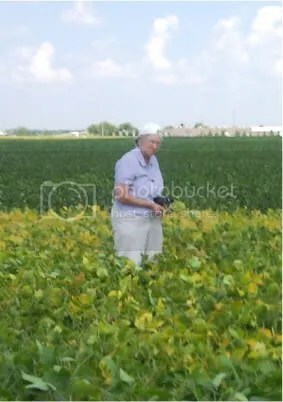 I had the chance on September 11 to spend a few minutes in the field with Dr. Anne Dorrance while we examined my brown stem rot plots. Foliar symptoms, when present, consist of wilting, chlorosis, and browning of the tissue between the veins. These foliar symptoms are very similar sudden-death syndrome. Generally, the two diseases can be distinguished by looking at the soybean pith. With brown stem rot, a brown to reddish brown discoloration of the stem pith occurs and can be continuous throughout the stem from the base of the plant upwards. If the pith appears healthy at first, give a second look for discoloration at the nodes. When this disease does develop it tends to be in fields that have been in continuous soybeans, short rotations, reduced tillage, or no-till. When disease is severe, yield reductions from 10 to 38% have been reported. The fungus, Phialophora gregata, only infects soybeans and is also residue borne. Entry filed under: crop disease, soybeans. Tags: brown stem rot, soybean disease, Soybean Sudden Death Syndrome, sudden death syndrome.